Putting your DR in the cloud will certainly be a very attractive option to consider when allocating funds for a resilient business. Businesses lacking in any portion of it will have a challenging time after a disaster impacts them. After 9/11/2001, the SEC published an interagency white paper on “Strengthening the Resilience of the US Financial System” due to the number of large financial institutions who were crippled on that day. Among the findings of the white paper was “…core clearing and settlement organizations should develop the capacity to recover and resume clearing and settlement activities within the business day on which the disruption occurs with the overall goal of achieving recovery and resumption within two hours after an event”. Now, a 2-Hour Recovery Time Objective (RTO) is not needed by every business, but 9/11 showed where Disaster Recovery was weak and where it needed to be improved for a business to survive a major disaster. One would think that would have been enough, but even today DR is often considered a cost to be contained rather than a benefit, in the event of a potentially business-ending disaster. And, there is no doubt that it is expensive. The largest on-going expenses are certainly from two main parts of the IT Infrastructure component. Facilities – storage systems, SAN switches, IP Networks, and servers which may be largely idle unless a disaster occurs. In the typical datacenter, there is some ability to grow resources on-demand, but you still need to pay for the hardware to be on the floor. 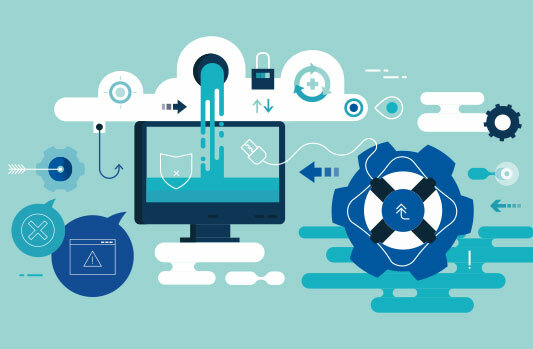 While one of the key components of business resilience has become more common, in the form of replicating the data stored in Disk Storage Systems, that is only part of the solution. As odd as it sounds, this is the perfect time to discuss another thing that businesses are investing in… Cloud. Cloud services are frequently overstated for their ability to reduce costs. In some cases, poorly managed cloud-enabled businesses may be less cost effective than if they kept their own datacenter. But Disaster Recovery is one area where it has an enormous potential to shine. The benefit of cloud is not in cost, but flexibility. You may not use many resources at any given time, but if you need additional resources, it is easy to expand them in a cloud. Looking at the most expensive parts of DR infrastructure, the network bandwidth isn’t going to change, but the facilities costs could be much better managed in the Cloud. You could provision a minimal amount of server and network capacity in a public cloud, while maintaining a consistent copy of data through asynchronous replication. If you have a DR test or experience an actual disaster, a cloud enabled environment can burst up to the capacity that need on-demand. But, on a day-to-day basis, you would not have idle resources in your facility. Going from a small amount of capacity to a large, fully redundant, high availability recovery environment is comparatively simple in a cloud. To make this a reality, IBM has an IBM Spectrum Virtualize for Public Cloud offering. This has been available in the IBM Cloud, but has now been announced for use in Amazon Web Services (AWS) EC2 instances. IBM Spectrum Virtualize is the code that runs SAN Volume Controller, FlashSystem 9100, and Storwize storage systems. In Amazon Web Services, that same code runs in pairs of EC2 instances rather than in node pairs. With that common codebase, you could replicate your data asynchronously from your local datacenter to an Amazon instance, in order to maintain disaster readiness. Data Protection can be achieved through backups and Snap Shots (via FlashCopy), just as it would in your datacenter’s IT Infrastructure. In the event of a true disaster, you could grow a full-powered DR site in Amazon, with the server and networking available through EC2 instances, and storage provided through an interface that you’re already comfortable with in your on-premise storage systems. There will be some differences. There is no current Fibre Channel SAN option in AWS EC2 instances (or in most other public cloud service provider offerings), so iSCSI will need to be assumed, and there may be some other infrastructure changes that arise. This would not require attaching the Disaster Recovery systems to storage via Amazon S3, which is an Object Storage API. Also, just as the host connections are iSCSI, this will require that replication be done using the IP replication partnerships, rather than Fibre Channel over IP. It also needs to be said that this doesn’t remove the need for Procedures or Automation. Without clearly written procedures for Disaster Recovery, the people who are attempting to recover your critical systems might not understand how to follow the instructions correctly. Remember, during a disaster you may not have access to the people who normally practiced the procedures, and who wrote the directions. Without automation, you may have too many manual processes to effectively recover from the event. But, putting your DR in the public cloud will certainly be a very attractive option to consider when allocating funds to make the critical business systems able to recover from a disaster. DRaaS is, of course, just one aspect of a Cloud Strategy that can contain learning how to include hybrid cloud and multi-cloud operations, in order to take advantage of what is done well in the data center, as well as in various cloud providers. Mainline’s DR practice has helped many of our clients to plan, design and implement their disaster recovery/business continuity processes… on premise off premise, between data centers, to 3rd Party DR facilities and even using Managed Services. Learn more about Business Continuity Planning.